Mom's Gone Bronson! : The Walking Dead, Season 6, Episode 4. - "Here's Not Here!" The Walking Dead, Season 6, Episode 4. - "Here's Not Here!" 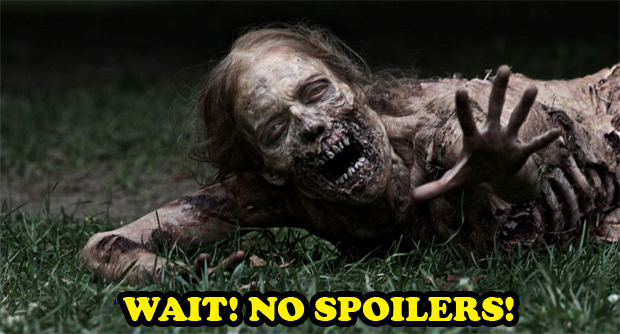 First of all, if you haven't seen the newest ep, then here be spoilers! Think twice before proceeding if you do not want to know what happened this week! This was 90 minutes of Morgan, running around. First with out a stick, and then with a stick and a cheesemaker! Saving a goat, then not saving a goat, and eventually not the cheesemaker either. Here IS the "Not Here!" that Morgan speaks of, and we do (sort of) get why Morgan is a chaged man. I really do not know why they made this a 90 minute episode, they really could have cut a lot of it out. I do get what they were trying to do though, other than make everyone wait to find out Glenn's fate! The one big thing we DO know, right at the end of this episode, though, is that RICK made it back to Alexandria some how! That was his voice shouting to open the gates, no? I think so! So let us hope something at least gets a resolution this next time around, even though I doubt we'll find out about poor-old-Glenn for a while, yet, even if the writers already took his name out of the opening credits! - are they messing with us? WHO KNOWS! I am not buying what he is selling. His approach can only work if he's living in Eastman's house and on his own. His peaceful approach is affecting the people around him and you don't get to make peaceful decisions like that for everyone in the bigger group. Something horrific is going to come from his actions and snap him back to a place he needs to be to either defend the whole, or to die - he will be ready, whichever way it goes down, but I don't see Morgan making it out of season 6 alive - sorry guys! And that "wolf" - hmn...trouble is brewing...naughty Morgan. Should have put him down while you had the chance! Cliffhangers everywhere this season, and so far, well played! 3 out of 4 decent episodes, if you managed to make it past that annoying first episode, which had to happen to get to where we will be next week - in retrospect I now appreciate it more. Disclaimer: I am in no way associated with this TV show or any rights to anything related to it. These are just the ramblings of one humble fan. Thank you.